I took a break today at work and got outside for a short hike to stretch my legs and enjoy the beautiful weather. The only active birds were a flock of Blue Jays calling back and forth with some fun vocalizations. The trees were starting to change color and the first fallen leaves of the year crunched underfoot. There is one thing I'm happy didn't go crunch underfoot however. 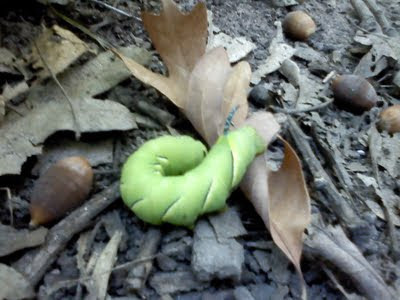 I happened upon this beautiful and large Sphinx moth caterpillar. I had my phone with me so I shot some photos and video. It was a beautiful green with black and yellow slash marks along the sides. The head is on the left in this photo. Check out the "horn" on the tail! These are sometimes called "Horntails" because of that (harmless) appendage. 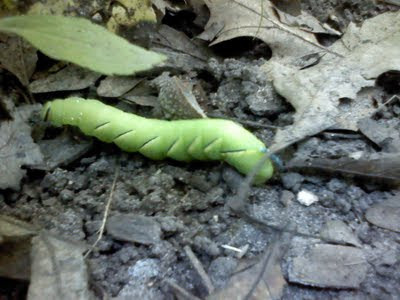 Here's the video I shot of the caterpillar crossing the trail. My best guess is that it is a Laural Sphinx Moth Sphinx kalmiae. The tail is blue with black markings. This one was close to four inches long and as big around as my finger! I'm doing an overnight program this weekend so I'll have to keep my eyes open for the adult stage of this moth. Even though this is called the Laurel Sphinx and they do eat Laurel, the most likely food it would eat at the nature center is poplar. Being so late in the year this is likely from the second brood of the year. It will likely pupate and overwinter. If it survives, we'll have a Laurel Sphinx moth flying around in the woods.